An experienced on-camera actor, Lisa Jayne has brought characters to life in commercials, industrials, and on soaps, and is a member of SAG-AFTRA. If you are working on a professional on-camera production, contact Lisa Jayne to have your story brought to life. You may recognize Lisa Jayne as the less-than-happy neighbor on Cablevision's News 12 spot. The photograph at the right is from the shoot in a New York neighborhood. Produced by O Positive Productions. Lisa Jayne can be seen on Starz/Encore in its new Playing Favorites spots. Shown is a still from the commercial, as well as a picture taken during the shoot in New York City. Produced by The Concept Farm. 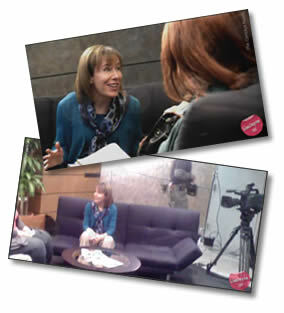 Lisa Jayne as a psychiatrist for Concerta Speaker Training video and photo shoot. Produced by Osprey Communications.